It is with great sadness that we report that Legend Manny Karageorgiou (S0045) lost his long battle with Multiple Myeloma January 4th. He was diagnosed early in 2014 so completed the 2014 to 2016 Melbourne Marathons while receiving treatment. 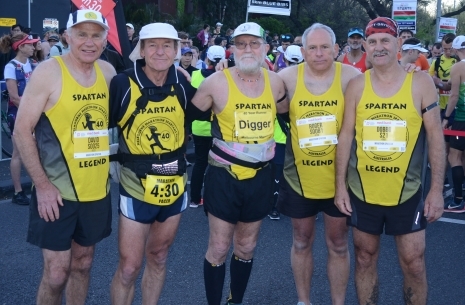 Manny is third from left in this photograph with the other Spartan Legends prior to the start of the 2017 marathon. He knew that he was too ill to complete the event, but was determined to start, wearing his gold 40th singlet. The Legends were delighted to see him, but greatly saddened by the thought that he would be unable to finish. His fastest marathon of 3hr26min51sec was set in 2001. We don’t have many pictures of Manny, but the image below shows him leading me (David Foskey) home in 1998 in a time of 3hr42min. Two or three years ago I ran several kilometres with him along Beach Road, and I was impressed by the large number of relatives and friends who had come to watch and support him. He isn’t wearing a gold singlet in this photograph, and I believe that he ran without a Spartan singlet in some other years. I’m not sure why, but it could have been unwarranted modesty on his part. Here are some blog posts on Manny posted by his friend and fellow Spartan Howard Goldenberg. After you have read them you will better understand how much Manny will be missed. Howard posts on a wide range of subjects on his blog . Recommended. This obituary, also written by Howard Goldenberg, was published in The Age on March 16, 2018. See it online here. 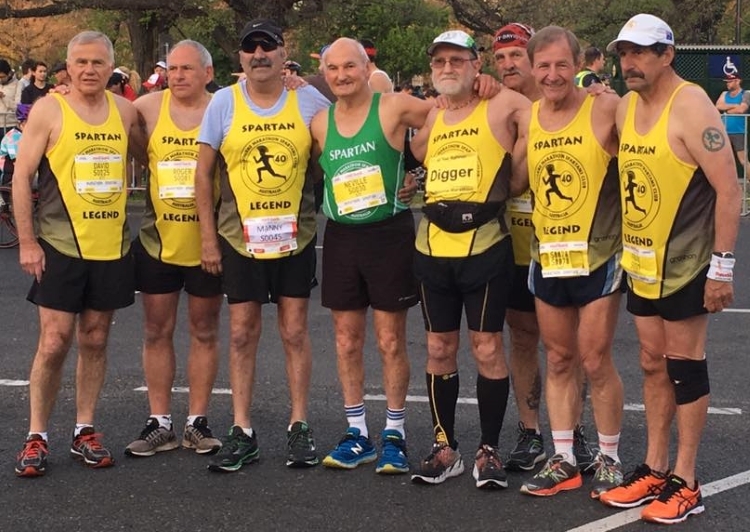 The photo at left shows the five Legends before the start of the 2018 marathon. It isn’t obvious from the photo, but all have black armbands in honour of Manny. From left to right, David Foskey, Wayne Thompson, Bruce Digger Hargreaves, Roger Weinstein and John Dobson. See more information on Manny the runner as one of the Legends. 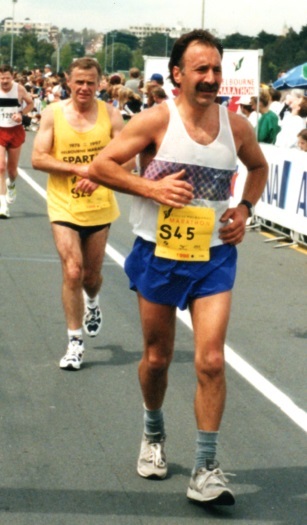 Here is a tribute to Manny on the Melbourne Marathon site. And here is a 2011 story on Manny, the “Greek Spartan”.